This Best Ever Slow Cooker Beef Bourguignon has been sponsored by Grocery Outlet. All content and opinions expressed here are entirely my own. Thanks for reading! 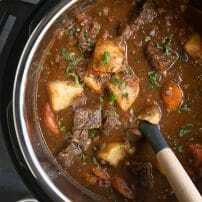 Slow Cooker Beef Bourguignon is a delicious slow cooked beef stew made with juicy chunks of beef, sweet carrots, onions, mushrooms, and two types of wine. 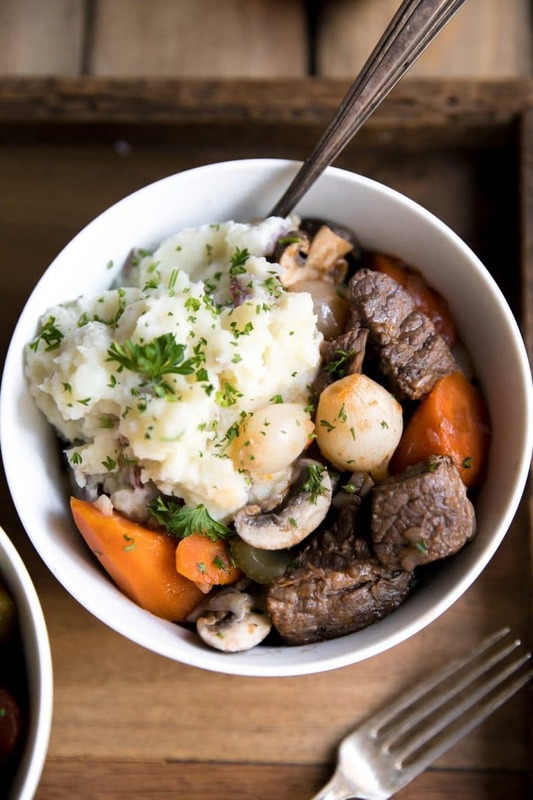 Fancy enough to feed a crowd, but easy enough to make during the week, this Slow Cooker Beef Bourguignon is a classic beef stew with a twist. 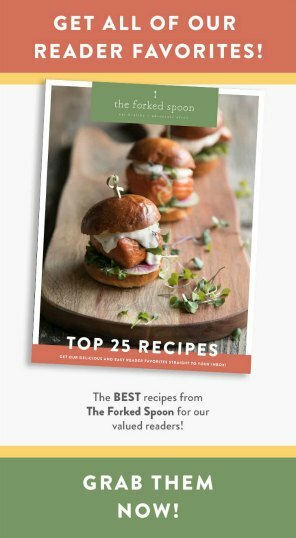 Hearty, comforting stews are a favorite on The Forked Spoon and include recipes such as Persian Pomegranate and Walnut Stew, Easy Hungarian Beef Goulash, and Instant Pot Beef Stew. I don’t make beef often. It’s not that I don’t love the stuff. I do. I mean, my mom is from Iowa and my dad is from Illinois which practically guarantees that a kid will be raised on meat and (butter-filled) potatoes. However, at some point in my teenage years and early twenties, I phased out red meat. Between periods of being a vegetarian or vegan, I just stopped buying the stuff. But sometimes a Mama just needs to make beef. And this (seriously) Best Ever Slow Cooker Beef Bourguignon is the absolute favorite in our house. Especially with my meat-loving 4-year old. Beef Bourguignon originated in the Burgundy region of France. This beef stew was originally prepared with beef braised in red wine. Wine was originally used to tenderize cuts of meat that would have otherwise been too tough to cook. In this recipe, you will notice that I added red wine AND sweet marsala wine. You don’t have to add marsala wine, but if you have any lying around, do it! Sweet Marsala wine gives this dish a fantastic rich flavor. You’ll never go back to regular old Beef Burgundy. One thing to note, however. I would not recommend replacing ALL wine with Sweet Marsala Wine. Some is good, all is not. In my lifetime, I have made beef stew many many times. Sometimes with just red wine and other times with both red wine and marsala wine. 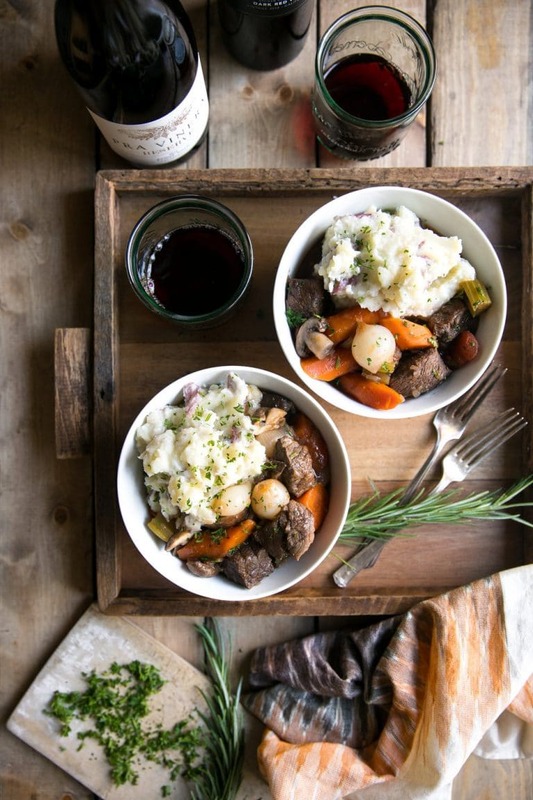 DO YOU HAVE TO ADD RED WINE TO BEEF BOURGUIGNON? The short answer is, no. You don’t have to do anything. In fact, my mother-in-law never adds wine to her beef stew and my husband grew up thinking it was the best beef stew on the planet. Without red wine, Beef Bourguignon isn’t really Beef Bourguignon. It’s beef stew. 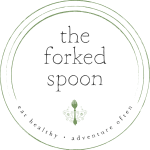 So, if you love wine and you love cooking with wine, then seriously add the wine 🙂 Plus, according to my husband, my beef stew is “much more refined and elegant” compared to his moms. No offense to his mom, of course. My mother-in-law makes some of the most fabulous food I have ever eaten. 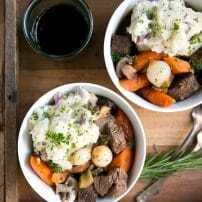 DO I HAVE TO USE A SLOW COOKER TO MAKE THIS EASY BEEF BOURGUIGNON? No way. Absolutely not. After all, were slow cookers around in France hundreds of years ago? nope. 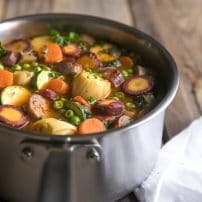 You can most definitely make this beef stew in a good old-fashioned heavy-bottomed pot or Dutch oven. This is exactly how my mother-in-law always makes her beef stew and (dare I say) here stew usually comes out more tender than mine. But, the slow cooker has a very important place in every kitchen and that is so you can leave it, let it cook, and walk away. I’m a pretty big fan. 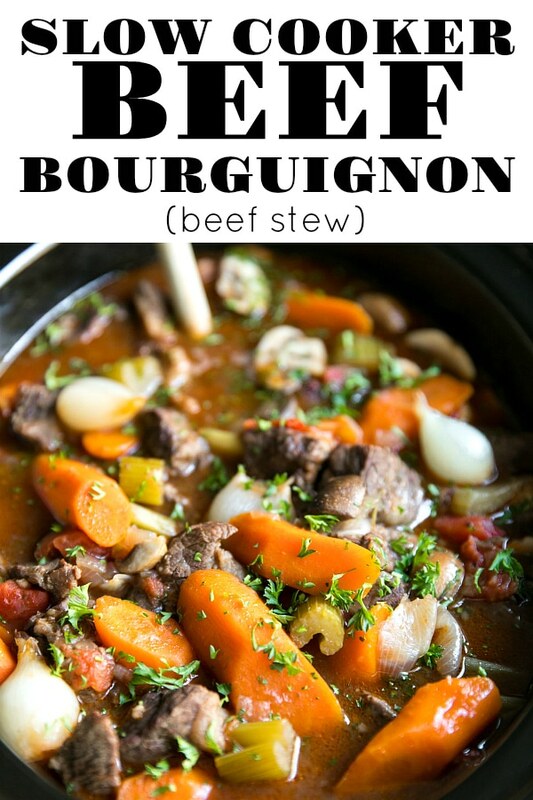 If you try cooking this Slow Cooker Beef Bourguignon Recipe, please leave me a comment and let me know! I always love to hear your thoughts. 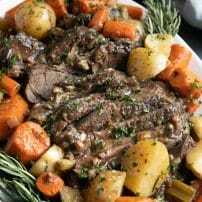 DON’T FORGET TO PIN AND SHARE THIS SLOW COOKER BEEF BOURGUIGNON TO MAKE FOR A FLAVORFUL AND COMFORTING DINNER THE WHOLE FAMILY WILL LOVE. 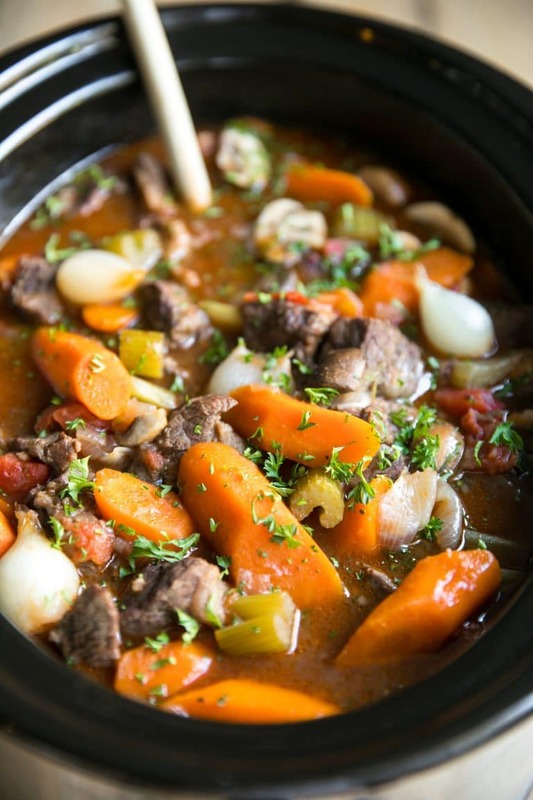 Delicious slow cooked beef stew made with juicy chunks of beef, sweet carrots, onions, mushrooms, and two types of wine. Grab a slow cooker or a large pot, as this Beef Bourguignon is fancy enough to feed a crowd but easy enough to make during the week. Gently pat chuck roast dry and season generously with salt and pepper. Heat a large skillet over medium high heat and add 2 tablespoons olive oil to the pan. Add the chuck roast cubes to the skillet and cook each side for 3-4 minutes, or until lightly browned (no need to fully cook the meat, just brown the sides). Transfer seared chuck roast to the slow cooker. 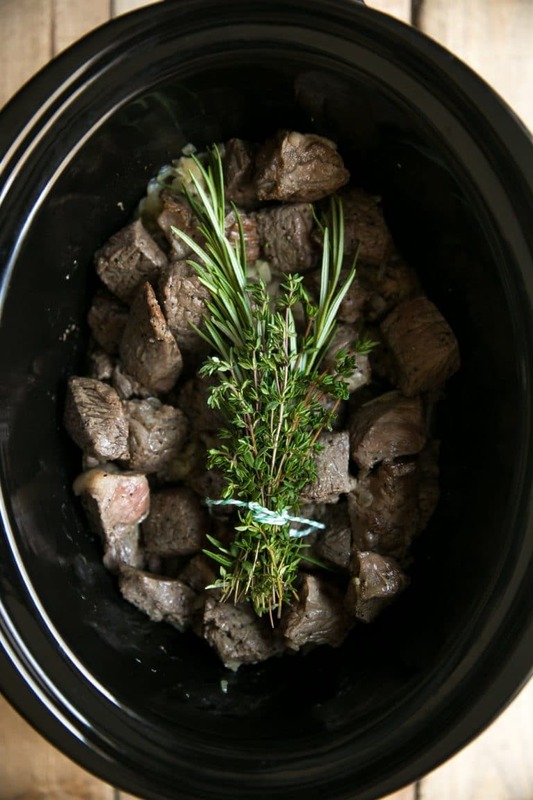 Tie the fresh thyme and rosemary bunches together using cooking string and place in the slow cooker on top of the chuck roast. Return the skillet to medium high heat and add the remaining tablespoon of olive oil. Add the diced onion and sauté for 3-4 minutes, or until onion are translucent and starting to soften. Add the garlic and sauté for one more minute. Transfer to the onions and garlic to the slow cooker. For a final time, return the skillet to medium heat. Add the red wine and use a wood spoon to gently scrape off any brown bits that may have stuck to the pan. Whisk in the marsala wine, beef broth and tomato paste. Heat just until mixture is warmed through- no need to boil. 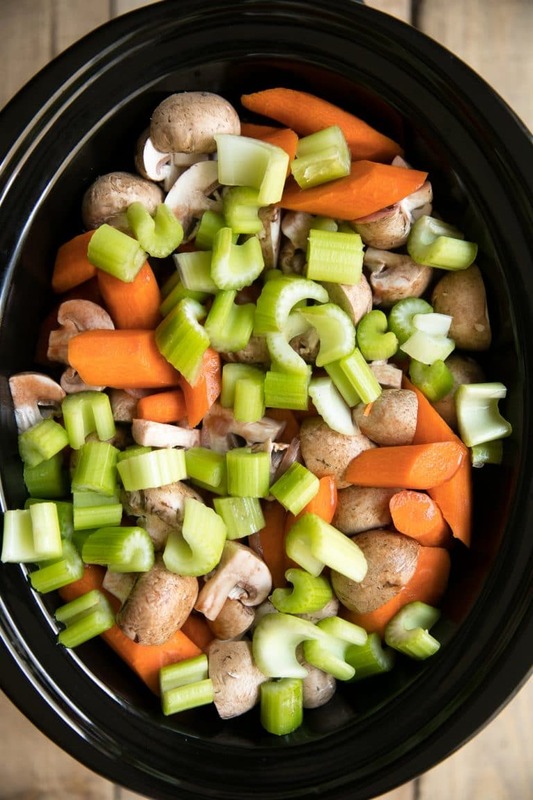 Add the chopped carrots, mushrooms, celery, canned tomatoes, and sun-dried tomatoes to the slow cooker and carefully pour the red wine mixture over the vegetables. Garnish with fresh chopped flat leaf parsley. Cook Time: 5 hours High, 8 hours Low. The cornstarch will thicken the broth, or gravy, of the stew. It is not a necessary step as it is purely personal preference. Great dish. I do like your recipes. I do love a good beef bourguignon and this one looks mouth watering! Perfect comfort food! This looks likes the perfect hearty meal and I can’t wait to make it for my family. I love that it is a slow cooker meal too. This is such a well written post! I simply loved it. You have added amazing value to the content. I am a vegetarian so beef is out for me but I enjoyed reading it. 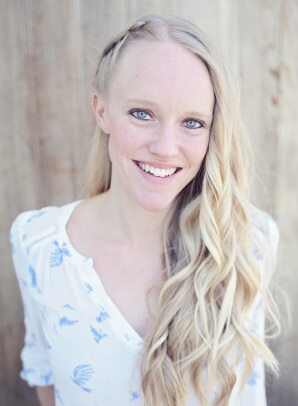 Absolutely loved the photos! Oh my gosh! This stew looks so tasty! We eat stew all year long here (in Arizona) because if we wait for the weather to cool off…well that day may never come! Pinning this one to try next time, thanks! What a fabulous Sunday dinner idea! Love how hearty and tasty this looks!